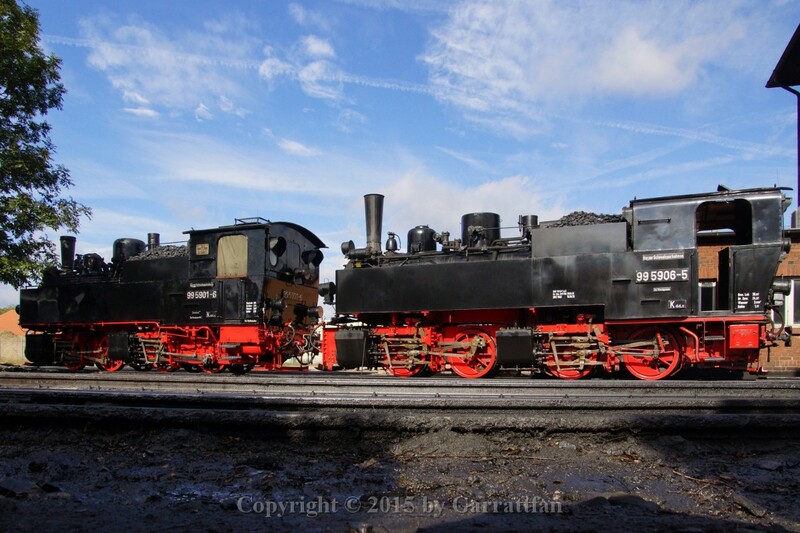 During our 2015 visit to the Harz, Germany, I visited the Harzer Schmalspurbahnen. Special treat of this railway is that they still own four Mallets of which three are operable. I found two. I saw one in actual operation in front of a special. This album is dedicated to the mallets of the Harz. 1 On our first walk from our holiday home to the town center of Wernigerode I got this first sighting of the locomotive type I really came for: the mallets. Admittedly all steam operation on the HSB is highly attractive, do not get me wrong, but my special interest is articulated steam locomotives and I have never seen a mallet in real operation. 2 My first sighting. No less than two! On the background there is a viewing platform, a treat for loco spotters! 3 The mallet is even the HSB's icon. 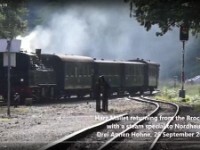 For the first fifty years of the Harz narrow gauge railways the mallets have been the main stay of the motive power. 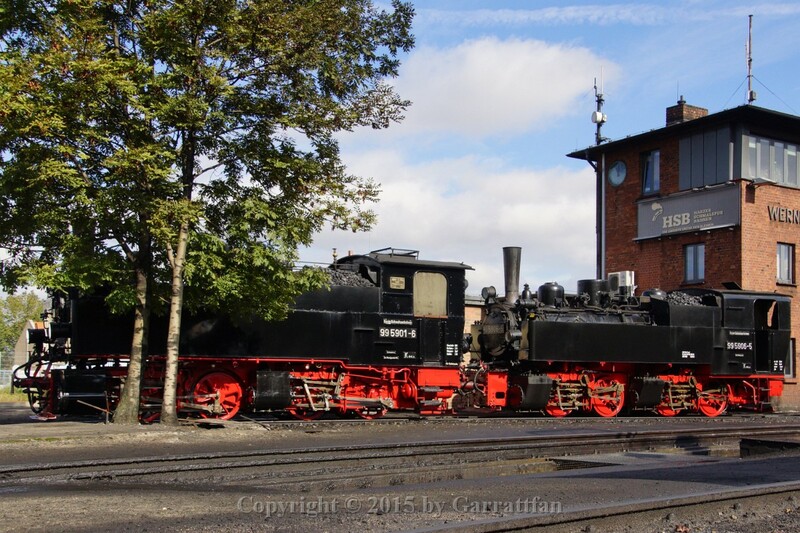 4 Now follows a set of photos taken on Thursday 24 September in Wernigerode. I found both the 5901 and the 5906. 5 Old and new. The 99-72's were built in the 50s to relief and finally replace the Mallets. They did, but before all Mallets could be disposed of necessity and the idea of preservation kept them going in "Traditionzüge", tradition trains. 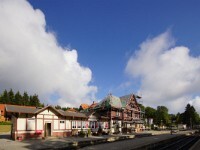 Now they are jointly supporting the attractiveness of the HSB line for tourists and railway enthusiasts alike. 6 The mallets had reasonable forward riding capabilities. 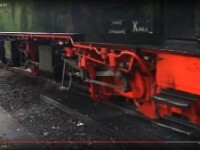 With the front bogie leading the locomotive "hooked" reasonably smoothly into curves. Riding in reverse, cab first, they where however notoriously bad riders, the then leading fixed bogie being hard on track and curves giving rise to much wear and tear and in some cases derailments. 7 The two types of mallets in one picture. 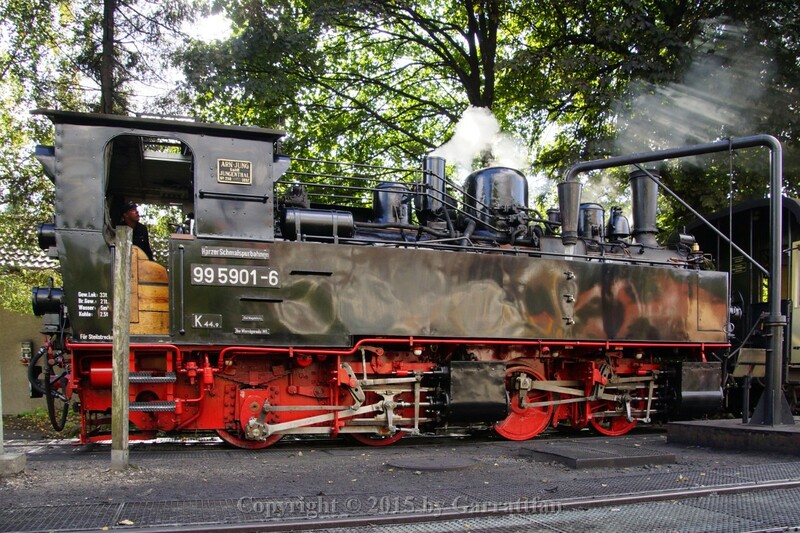 The 5906 is different because it was originally ordered by the German Army in WW1. 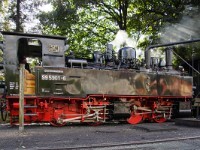 It was purchased by one of the Harz railways in 1920. 8 The leading driver set, which is the articulated part. It swivels around a hinge immediately in front of the second set of cylinders. This way a mallet was more suitable for curved track than a rigid frame locomotive with the same number of coupled axles. 11 The rear driver set is fixed in the frame. 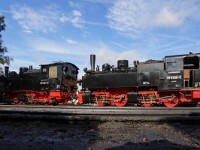 This is one of the landmarks that distinguishes 5906 from the other three mallet as only the 5906 has an inside frame. 12 The difference in detail. 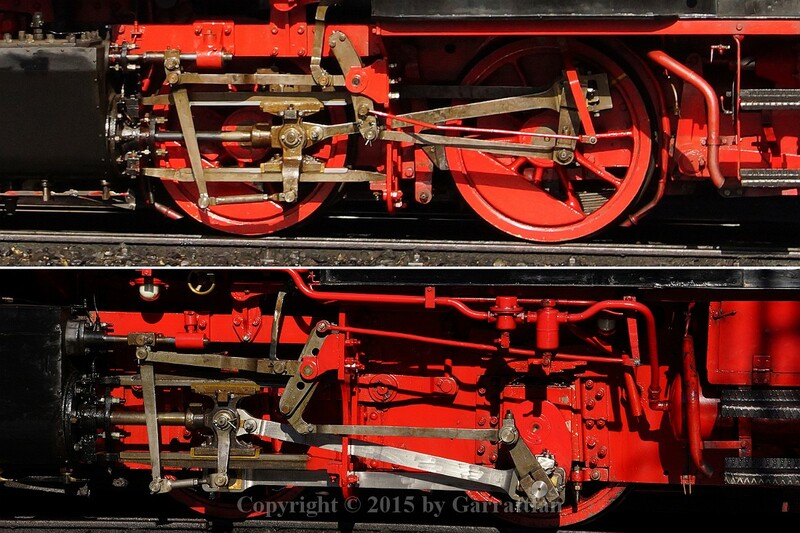 The upper photo shows the inside framed rear driver set of 5906. 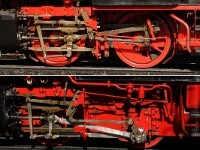 The lower photo shows the outside framed rear driver set of the 5901. 16 Old and new. The 99-72's were built in the 50s to relief and finally replace the Mallets. They did, but before all Mallets could be disposed of the idea of preservation kept them going in "Traditionzüge", tradition trains. 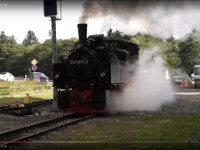 Now they are jointly supporting the attractiveness of the HSB line for tourists and railway enthusiasts alike. 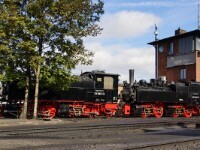 17 When I went to the station on Friday 25 September I saw the pair leave Wernigerode under their own power. Unfortunatedly I arrived too late to make any photos. I knew there would be steam specials the following day so I suspected they where going to Nordhausen. 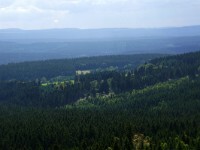 18 I was informed that one of the specials would go up the Brocken. 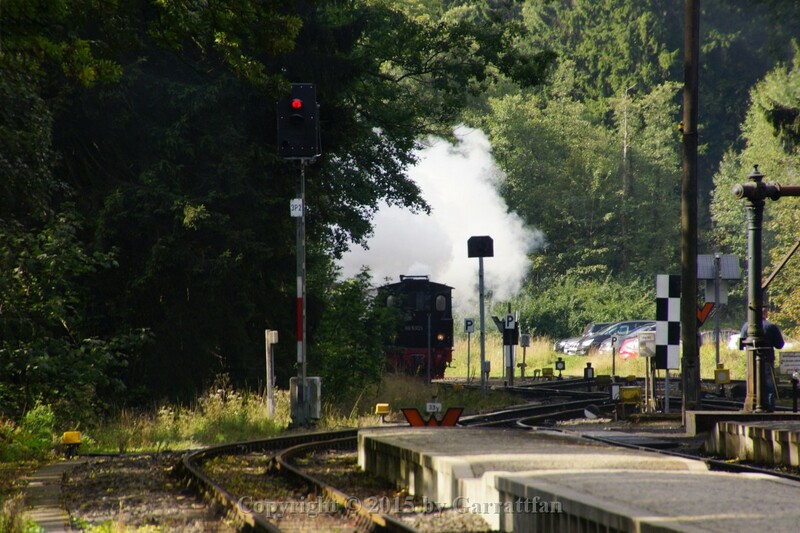 So on the next day, Saturday 26 September, I put up camp in Drei Annen Hohne to intercept that particular train to see a mallet working for the first time in my life. 19 My first shot of a moving mallet ever. 22 At last on a photo with a live mallet!! 43 Recoaling "à l'improviste". The mallets where notorious for their small coal supplies. Even the welded-on bin did little to change this inconvenience, a problem that was never really solved. 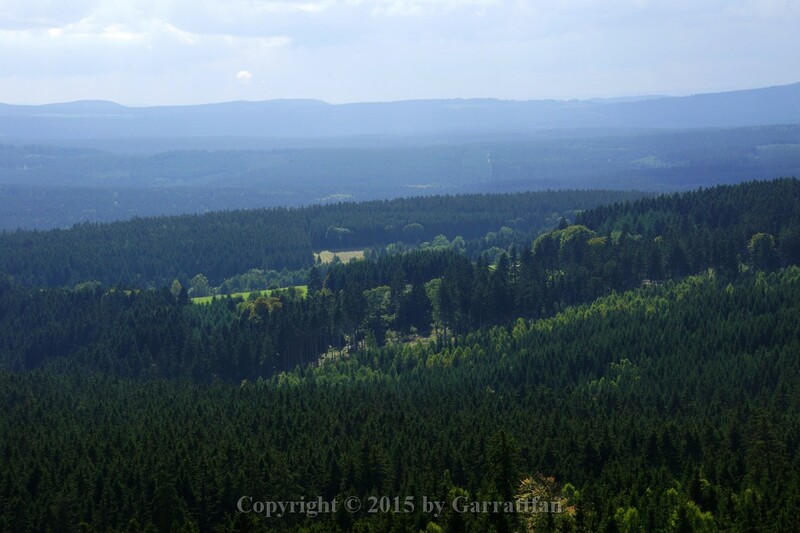 54 After having trialled my other half's patience we made a walk through the stunning scenery around Drei Annen Hohne. 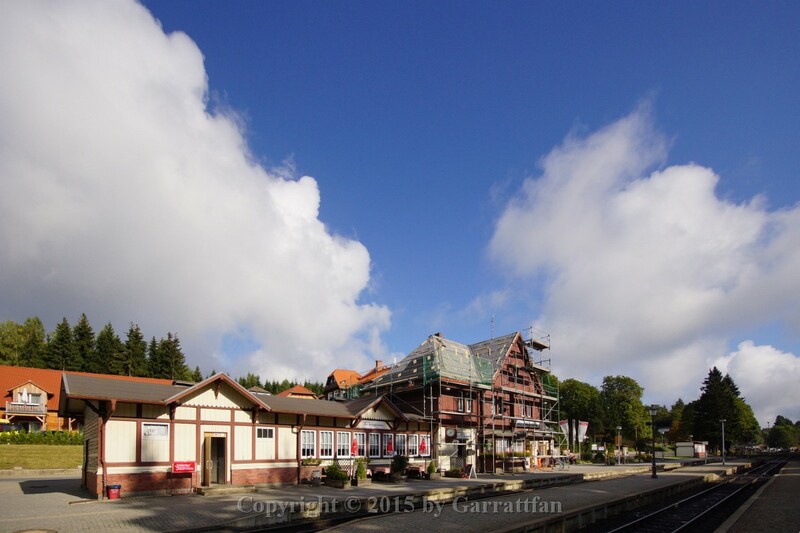 By sheer coincidence we arrived back at the station just minutes before the mallet's return from the Brocken. Believe it or not, it was really unplanned, but I heard the loco's whistle resound through the forest when we entered the station area. 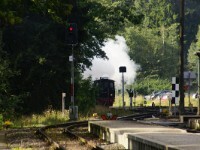 I was ready with my camera with just seconds to spare when the loco arrived. 69 The coaches of the train are also as of old. I don't know if they really are. 80 At the evening of the same day I made this night shot. The engine had cooled down and as abviously put away for some longer period of time.